This week debut sales figures were released for two new United States Mint products, the 2010-P Mount Hood National Forest Five Ounce Silver Uncirculated Coin and the Gettysburg Quarter Three-Coin Set. Both products enjoyed solid starts, but the Mount Hood five ouncer is moving slower as compared against previous designs in the series. Buyers ordered 14,759, or 54.7 percent of the maximum 27,000 Mount Hood silver coins between their launch on Thursday, July 28, through to Tuesday, August 2. 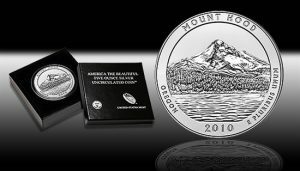 Mount Hood’s release marks the fifth issue in the United States Mint’s five ounce America the Beautiful coin series. Sales debuts for the first four coins hovered at least around the 20,000 level. The first three designs, also launched this year, sold out. The fourth Grand Canyon coin is still available with current US Mint sales of 23,728. Whether sales started slower due to the traditional summer doldrums or dwindling interest in the series or its design, Mount Hood coins have a steeper climb to achieve a sellout. The Gettysburg Quarter Three-Coin Set was released on Wednesday, July 27. Collectors grabbed 12,500 during its debut period, giving it a comparable start to the first five sets. Past openings include Hot Springs at 10,684; Yellowstone at 11,115; Yosemite at 11,441; Grand Canyon at 12,418; and Mount Hood at 11,282. Two successive weeks of price increases looks to have affected gold coins. The tell-tale sign is the one ounce 2011 Proof Gold American Eagle. Its US Mint sales rose 380 versus the 4,511 increase reported last week and the 2,362 from the week before that. Although higher prices are not the only reason, as most of the Mint’s silver products slowed as well. As an example, and although still a good number, the weekly increase of the 2011 Proof Silver American Eagle was reported at 28,522 against the previous 133,420. *The as of date for US Mint sales of 1-ounce and under bullion coins is Wednesday, August 3, 2011. For reference, 53,000 of the 2010-dated 1-ounce Gold Eagles remained for sale earlier this year and are included in the overall totals. The bullion sales figures also include 469,500 of the 2010-dated Silver Eagle bullion coins sold in January. **The US Mint does not typically provide weekly per coin sales totals for the Olympic, Vicksburg and Chickasaw America the Beautiful 5-ounce Silver Bullion Coins. The individuals totals listed above are as of Monday, August 2. The collector coin sales figures above have an "as of date" of August 2, 2011.